I have a new favorite singer ---and her name is Davina! The Davina in question here is Davina Sowers, leader of the Minnesota-based band Davina and the Vagabonds. While they hail from the upper Midwest, their music has strong origins in New Orleans. It’s very retro in that Davina’s style is reminiscent of the early woman blues singers like Bessie Smith and Ma Rainey. But there’s a such a contemporary spark and energy to their music that nothing sounds at all dated on their new CD, Black Cloud (Roustabout Records). In fact, every song on the disc is a Davina original, although they all sound like they could have been written nearly a century ago. Another factor that contributes to the uniqueness of their sound is the integral role of trombone player Darren Sterud, who takes many of the instrumental leads. Davina is also a fine piano player, and her tickling of ivories provides the perfect complement to Sterud’s upfront trombone playing. 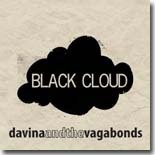 Black Cloud is an album that keeps getting better, with the high points coming on the disc’s eighth and ninth cuts. “River” starts off with a gospel-sounding intro but with Sterud’s trombone taking the lead instead of the more traditional piano sound. Davina’s vocals are especially strong here and give the song a real churchy feel. Following that song is the equally strong “Pocket,” on which Davina’s powerful and sassy voice soars through more octaves than seemingly humanly possible. It’s kind of a funky number that features some nice solos from trumpet player Dan Eikmeier. The back to back combo of “River” and “Pocket” are alone worth the price of the album. But wait, there’s more great stuff here! Davina’s gospel piano leads into the slow, torchy song “Sugar Moon,” another one on which she gets to show off her impressive vocal range. The horns tastefully complement Davina without overstepping their bounds. Another absolute gem is the slow gospel number “Carry Him With You.” Davina provides most of the accompaniment with her nice piano work, with subtle accompaniment from upright bass player Michael Carvale and what sounds like a little bit of background organ. Davina sings on this song, “I have a voice …” Indeed she does! Black Cloud is one of the best to come along this year. Every once in a while I start to get the jaded feeling that every new blues album sounds just like the dozens that preceded it, but not so with this one. It’s a refreshing sound that will hold up under repeated listens. Get it now, and prepare to become entranced by the sound of Davina and the Vagabonds! Some of the most entertaining New Orleans-flavored blues and jazz currently being played is coming out of the state of Minnesota, via Davina and the Vagabonds. Davina Sowers is a classically trained pianist and one of the most distinctive and expressive vocalists to come around in a while. With tight backing from the Vagabonds (Michael Carvale – upright bass, Connor McRae – drums, Darren Sterud – trombone, Dan Eikmeier – trumpet), the group has impressed blues fans all over the world playing festivals and sharing the stage with Little Feat, Buddy Guy, Elvin Bishop, Irma Thomas, Joe Bonamassa, and James Hunter. Everything is in place for the group’s fourth release, Black Cloud (Roustabout Records), to be their best, and they don’t disappoint. This is an interesting disc for several reasons. For starters, the style of music (New Orleans jazz mixed with blues, swing, soul, and gospel) is rarely heard these days and when it’s done this well, it really should be heard. Second, the vocal stylings of Ms. Sowers have to be heard. She has the amazing ability to adapt her voice to the material more so than anybody I’ve heard in a long time. Good as these songs are, she raises them to the next level by herself. Sowers effortlessly handles the jazzier tunes (the gloomy title track and others like “Disappears,” “Pushpin,”), soul numbers (the beautiful “Sugar Moon,” and the incredible “River”), swing (the whimsical “Start Runnin’”), pop (“Pocket,” “Bee Sting,” “Crosseyed”), and straight blues (“Lipstick and Chrome”). The lovely closing vocal track is a gospel tune, “Carry Him With You,” and her performance on this one will raise chill bumps even on non-believers. The band gets to strut its stuff on the instrumental, “Vagabond Strut,” which opens the disc and closes it in an abbreviated version. Black Cloud is a fascinating disc. Davina Sowers’ commanding vocals are a thing of beauty and the music is a throwback to those vintage years when the trombone was a lead instrument. This one is highly recommended to listeners who like music the way it used to be played.